Deoxymab 3E10 is a lupus auto antibody that penetrates live cell nuclei by binding to DNA or its precursors outside of cells and then following it into cell nuclei through a nucleoside transporter. Once in the nucleus Deoxymab 3E10 interferes with DNA repair processes, but the degree of inhibition of DNA repair caused by Deoxymab 3E10 is modest and is not enough to kill a normal cell that has robust mechanisms to manage insults to DNA. On the other hand, many cancer cells are exquisitely sensitive to DNA damage because their DNA repair machinery is already impaired. 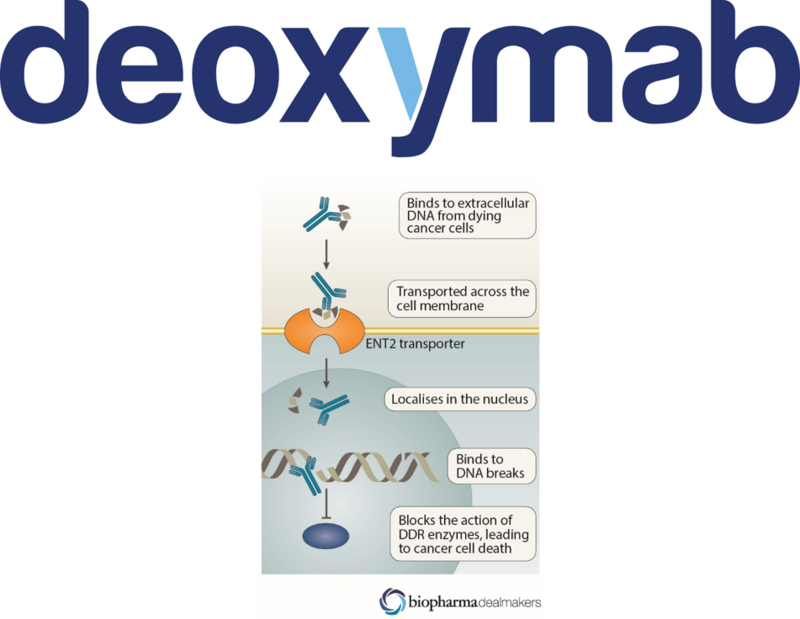 When these cancer cells encounter Deoxymab 3E10, they accumulate more DNA damage than they can handle and ultimately die. 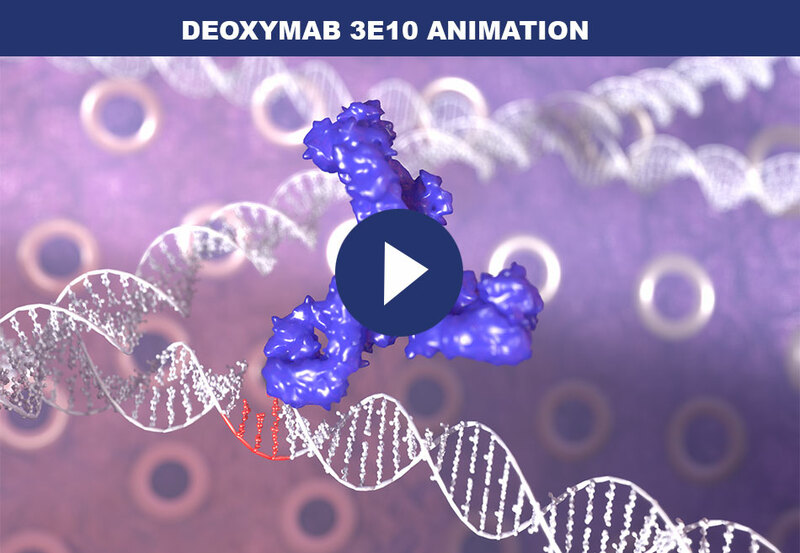 Deoxymab 3E10 is therefore selectively toxic to cancer cells that have deficiencies in DNA repair, which includes a wide range of malignancies such as gliomas, melanomas, prostate, breast, and ovarian cancers and many others. When combined with DNA-damaging agents such as chemotherapy or radiation, Deoxymab 3E10 has an even greater effect on these cancer cells. Deoxymab 3E10 is particularly well suited for use in cancer therapy because it preferentially localizes to tumors but not normal tissues. As tumors grow and go through cycles of proliferation they are constantly releasing DNA, and this results in accumulation of a “cloud” of DNA in the tumor vicinity. Deoxymab 3E10 is specifically attracted to DNA, and moreover is dependent on the presence of extracellular DNA in order to penetrate cell nuclei. The cloud of DNA in the tumor vicinity therefore not only attracts Deoxymab 3E10 to the area, but then also facilitates nuclear penetration by Deoxymab 3E10 into the tumor cell nuclei where it then inhibits DNA repair and kills the tumor cells and sensitizes them to DNA-damaging agents. To prepare Deoxymab 3E10 for clinical trial testing, the antibody sequence has been modified to remove any components that could carry a risk of causing lupus-like side effects. The lead candidate, to be known as PAT-DX1, was selected from a large number of Deoxymab 3E10 variants that Patrys designed to optimise for efficacy, manufacturability and novelty. The selection of PAT-DX1 was based on its performance in a suite of in vitro assays conducted in collaboration with the lead inventor of the Deoxymab technology, Dr James Hansen at Yale University in the USA. PAT-DX1 outperformed other variants in its ability to penetrate into cells’ nuclei, and also to kill cancers cells. Significantly, PAT-DX1 outperformed native forms of the Deoxymab 3E10 antibody in the screening assays. The confirmation of PAT-DX1 as lead candidate allows Patrys to move forward with the production of antibody to be used in a range of animal models of cancer. Recent pre-clinical work on PAT-DX1 has been presented at the American Association for Cancer Research (AACR) Annual Meeting 2018, see poster presentation. In June 2017, Patrys licensed from Yale University the worldwide rights to develop and commercialise technology pertaining to the linking of the novel anti-DNA antibody Deoxymab 3E10 to nanoparticles. The nanoparticles can be loaded with standard chemotherapeutic (or other) drugs and have been demonstrated to significantly increase the efficacy of the drug therapy in pre clinical models. The 3E10-nanoparticle conjugation intellectual property is the subject of a patent application filed by Yale University, which, if granted, will extend patent protection to 2036. The synergistic nature of the PAT-DX1 and nanoparticle programs allows both to be developed concurrently, allowing the leverage of development cost savings. The new Deoxymab 3E10 nanoparticle product has been designated PAT-DX1-NP. Deoxymab 5C6 is another lupus autoantibody that penetrates live cell nuclei, similar to Deoxymab 3E10 is highly toxic to cancer cells with DNA repair deficiencies and has similar potential to be used in cancer therapy. Z Chen, JM Patel, PW Noble, C Garcia, Z Hong, JE Hansen, J Zhou. A lupus anti-DNA autoantibody mediates autocatalytic, targeted delivery of nanoparticles to tumors. Oncotarget, 2016, 7(37): 59965-59975. PW Noble, S Bernatsky, AE Clarke, DA Isenberg, R Ramsey-Goldman, JE Hansen. DNA-damaging autoantibodies and cancer: the lupus butterfly theory. Nature Reviews Rheumatology, 2016, 12(7): 429-34. RH Weisbart, G Chan, G Jordaan, PW Noble, Y Liu, PM Glazer, RN Nishimura, JE Hansen. DNA-dependent targeting of cell nuclei by a lupus autoantibody. Sci Rep., 2015, 5: 12022. PW Noble, G Chan, MR Young, RH Weisbart, JE Hansen. Optimizing a lupus autoantibody for targeted cancer therapy. Cancer Res., 2015, 75(11): 2285-91. JE Hansen, G Chan, Y Liu, DC Hegan, S Dalal, E Dray, Y Kwon, Y Xu, X Xu, E Peterson-Roth, E Geiger, Y Liu, J Gera, JB Sweasy, P Sung, S Rockwell, RN Nishimura, RH Weisbart, PM Glazer. Targeting cancer with a lupus autoantibody. Sci Transl Med., 2012, 4(157): 157ra142. JE Hansen, CM Tse, G Chan, ER Heinze, RN Nishimura, RH Weisbart. Intranuclear protein transduction through a nucleoside salvage pathway. J Biol Chem., 2007, 282(29): 20790-3. F Spertini, A Leimgruber, B Morel, MB Khazaeli, K Yamamoto, JM Dayer, RH Weisbart, ML Lee. J Rheumatol., 1999, 26(12): 2602-8. RH Weisbart, M Stempniak, S Harris, DJ Zack, K Ferreri. An autoantibody is modified for use as a delivery system to target the cell nucleus: therapeutic implications. J Autoimmun., 1998, 11(5): 539-46. DJ Zack, M Stempniak, AL Wong, C Taylor, RH Weisbart. Mechanisms of cellular penetration and nuclear localization of an anti-double strand DNA autoantibody. J Immunol., 1996, 157(5): 2082-8. RH Weisbart, DT Noritake, AL Wong, G Chan, A Kacena, KK Colburn. A conserved anti-DNA antibody idiotype associated with nephritis in murine and human systemic lupus erythematosus. J Immunol., 1990, 144(7): 2653-8. PW Noble, MR Young, RH Weisbart, JE Hansen. A nucleolytic lupus autoantibody is toxic to BRCA2-deficient cancer cells. Sci Rep 2014 4: 5958.